There have been quite a few time travel shows over the past several years, ranging from the funny (Time Traveling Bong) to the unfortunately, deadly serious (Time After Time). 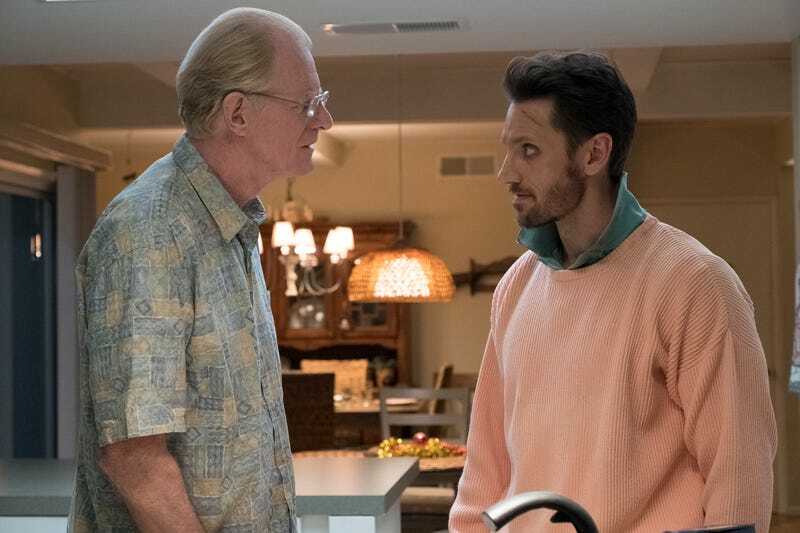 Future Man has positioned itself to potentially bridge that gap, playing the seriousness of its stakes and the intensity of its cast off the goofiness of jokes about how weird everything is in 2017 (or 1969). 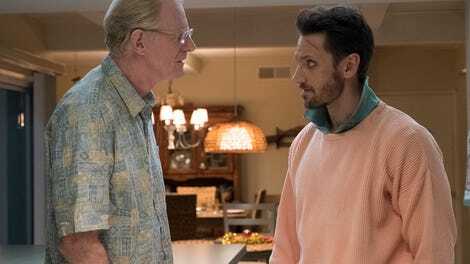 “Justice Desserts” is easily the best episode of Future Man so far, because it’s the one where the show comes closest to effectively blending both modes of storytelling. “Justice Desserts” pulls this off largely by having a more specific setting and plot than most of the episodes so far, which come by their main beats almost by accident. Here, the plan comes together relatively quickly: Wolf, Tiger, and Josh have two days to prepare poisonous truffle balls to serve at the Kronish Labs holiday party, which will help them figure out which of Josh’s co-workers are Biotics. Even though Wolf and Tiger have their own respective subplots with Josh’s parents, and Josh himself gets to know another Kronish employee, all of that material is ultimately in service of the eventual mass vomiting and shootout that happens at the holiday party. It’s a tightly plotted episode of television, hurray! Each of these stories also manages to capture a few different tones. Eliza Coupe’s aggressive confusion works very well alongside Glenne Headley, as Josh’s mom teaches Tiger how to use her feminine wiles to manipulate men (and also explains the concept of caring about other people). Headley is fantastic when she tries to claim that not all men think with their dicks before pausing and admitting to herself, and to the audience, “no, yeah, it is all men.” By the end of her training, Tiger has become a sneering seductress. Meanwhile, Ed Begley Jr. and Derek Wilson are absolutely hysterical together as Josh’s dad teaches Wolf how to cook. The plot where a seemingly hyper-masculine character turns out to be a savant at some domestic activity is pretty well-worn by now (there’s literally a Bob’s Burgers episode where Bob discovers that Zeke is a cooking genius), but Wilson and Begley Jr. commit so much to the bit that it doesn’t matter. Wolf destroys a carton of eggs with his bare hands while screaming “Your shell is weak!” only to discover that the laissez-faire parenting that probably contributed to Josh’s adult aimlessness works wonders for someone who has never been encouraged before. By the time Gabe tells Wolf he has something to say and that “my mouth is all ears,” I’m totally sold on Wolf’s shocking culinary skill. Everything culminates at the Kronish Ball, where Tiger uses her new manipulation skills to lure Stu away from the party so that Wolf has time to deliver an inspirational speech convincing the catering staff to make an entire second batch of Kronish balls. Eventually, they succeed in poisoning most of the employees, leading to the best fight scene Future Man has done so far. We follow Tiger, Wolf, and Josh as they weave through the vomiting humans, fighting with everything from teeth to candy canes until the last Biotic is impaled. (This is the “Die Hard is a Christmas movie” scene.) It’s a lot of fun because of the goofy kinetic energy Anton Cropper [Note: This review originally noted Nisha Ganatra as the episode’s director—ed.] brings to it—even if we don’t see some of the more eye-popping fight moments, experiencing them from Josh’s scared perspective as he cowers in a tight space is very funny. And the fight ends with one of the show’s most effective character moments so far: revealing that Jeri, Josh’s work crush, is a Biotic. The development of Jeri and Josh’s relationship is one of the stronger parts of the episode, suggesting that she could be a recurring character in the show, and possibly even an integral human member of the team. Jeri helps Josh get the recipe for the Kronish balls, catches him going through the lab’s employee records (and helps him do it), and eventually helps him escape from the police, for no apparent reason. In retrospect, this should be a warning sign: Why would any normal person act this way, unless they were trying to trick Josh? Capturing Jeri while setting off a countdown timer for the bomb in her head also neatly sets up a specific, tight narrative goal for the next episode, which is pretty exciting as Future Man moves into its midseason. Not for nothing, this is also the first episode to not suffer from its length. With the 40-minute mark in sight, it feels like “Justice Desserts” could actually make it to being an episode of an hour-long show. I wouldn’t want that version of the show, but it’s nice to know the creative team could pull it off.